This is a sponsored post in partnership with Hewlett Packard. I received compensation for participating in this campaign but all opinions are my own. There isn't much that gets me as excited as eating Thanksgiving dinner. The deep fried turkey, the mashed potatoes, the pies, I look forward to the splendor of the meal all year long. As a parent, I love sharing this time with my kids as well. The only problem with having kids is that they cut into the bounty of the dinner. For example, I love Turkey drumsticks. Growing up it was understood that they are mine. My daughter now loves them and my oldest son does as well. But if you just did the math that means no drumstick for me. Aside from my turkey thieves, the best part of Thanksgiving is family getting together. So we decided it would be really fun to create a craft that family could take home with them that showed them that the kids are thankful for them. This is where these placemats come in that we designed on the Sprout by HP. 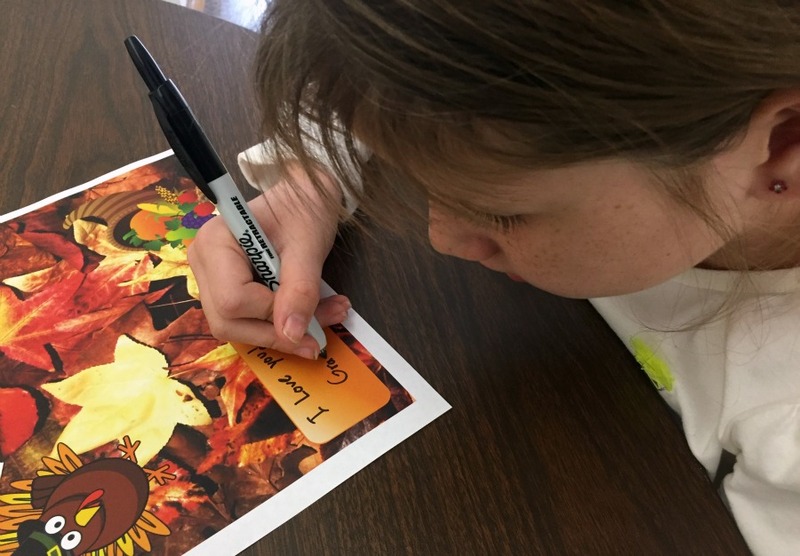 We really wanted to come up with something that was fall themed, the kids could help with, were personal, and easy to make. When you are in charge of Thanksgiving dinner the last thing you need is to create complicated decorations from scratch. 1. Collect leaves with your kids. 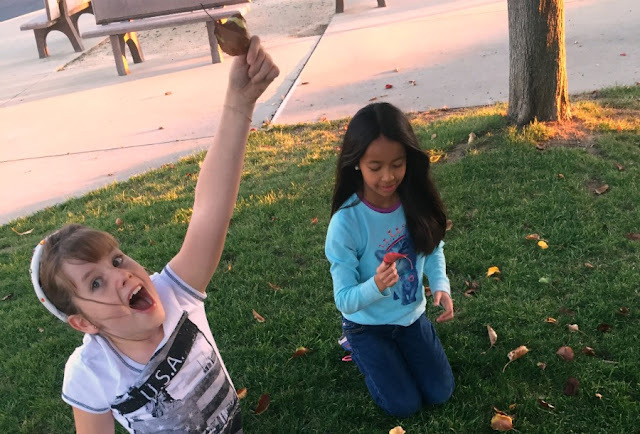 Go outside and have fun picking up many shapes, sizes, and colors of leaves. The more the better. In fact you should collect about twice as many as you think you will need. This will save you from having to go out and picking out more. 2. 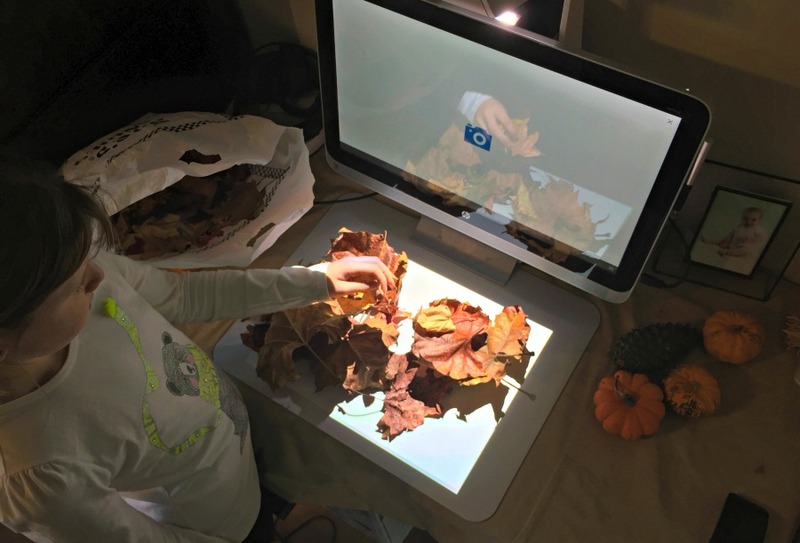 Place leaves on the Sprout's mat or your scanner, and take a picture of them. Layer big leaves, then medium, then small to make sure all the space is covered. You don't want any background showing through. We did this on our Sprout because it was just so easy to arrange the leaves on the mat, use the HD camera to scan them into the app, and then use the digital workspace to do what we did in the next step. The whole process took a matter of minutes. We didn't have to mess with trying to figure out a flatbed scanner or getting the picture from the camera to the PC only to find out the pictures were terrible. The Sprout took all the guesswork out of the process. 3. Insert digital Thanksgiving themed images from the internet. With the Sprout, we were able to use the same app that we scanned the leaves in with to copy and paste Thanksgiving clip art from the internet straight onto the picture in one step. 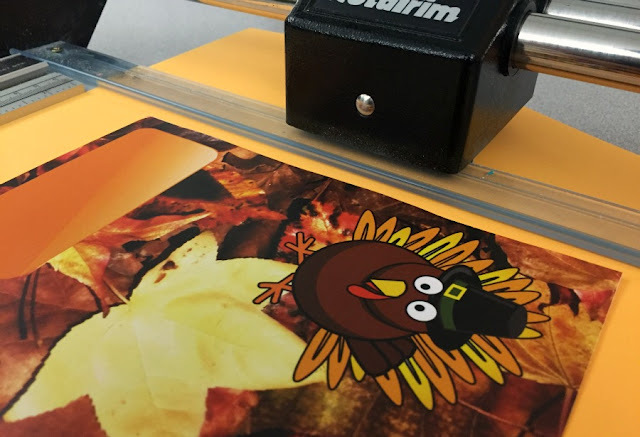 If you are using a camera you will want to move the picture to your computer, insert it into an image editing program, find the Thanksgiving clip art, save it to your computer, then insert it into whatever program you are using. I let the kids pick whatever digital clip art they wanted to put on the placemat. 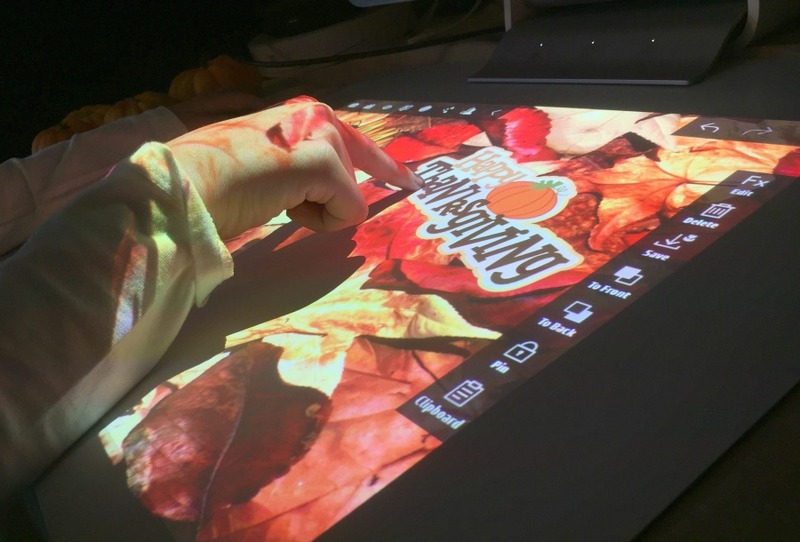 They then use the Sprout mat to easily resize and place the images so it truly was a craft that they played a big part in creating. Make sure and insert an image of a plain colored box somewhere on the placemat. This will be used to write a personal note. 4. Print out the placemat. 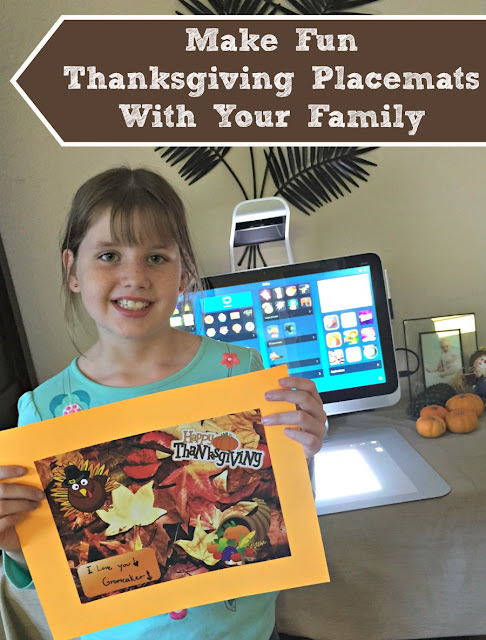 Print out the placemat using your color printer. Make enough copies for everyone that will be at the Thanksgiving table. The Sprout saves the project as a .pdf so it was easy to print out in the standard 8.5 x 11 inch size. Have your kids handwrite a note or just the name of the person on the plain colored box. 5. Mount the placemat on construction paper. Cut colored construction paper to the desired size and glue the printout to the construction paper. This will help the placemat be large enough for the place setting, but also give it some added sturdiness. You can also laminate each placemat so that Grandma and Grandpa can take it home as a gift and reuse it. 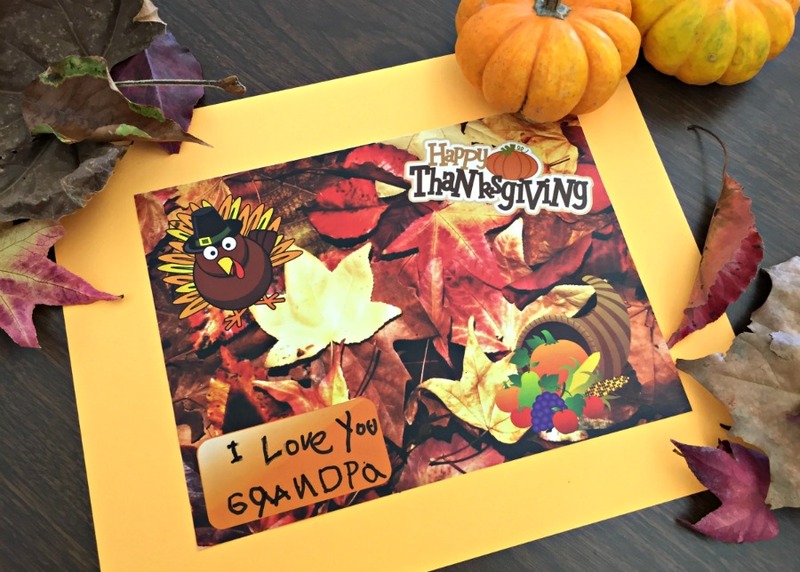 I hope you make some great memories this Thanksgiving and this simple craft can help in the process. My kids and I sure had tons of fun with it! For more information on the Sprout by HP, and all the free apps available, go to the website HERE. Have a wonderful Thanksgiving and remember to post your ideas on social media using #GoMakeThings!